BILLFISH We had some good catches this week but were plagued with inconsistency. Some days every boat had a marlin then the next they caught nothing as the fish moved around and refused to be tempted by the bait offered. Our top boat this week was 28 ft Adriana on March 8th for anglers Robert & Paul Henry from San Diego. They released three striped marlin and caught three dorado – perhaps it was something to do with Captain J.R from the Rebecca going out as the mate that day. A couple of days later this same boat, with the regular crew managed to release two marlin and catch a dorado at Cerros de Arena for Scott Pruitt and family from Dallas, Texas. Nathan Hawes fished a little further with Devon McCleery, from North Carolina aboard the Rebecca this same day and were fortunate to release a striped marlin each in the 100 to 140 lb class on live caballito. The only other boat that had more than one marlin was Bill Collector with two on March 9th both on live bait at Cabeza deBallena for Gerry Rosales fishing with Mario and Carter from Atlanta, Georgia. There was no set game plan to be able to catch marlin this week, as they were spread out and not always hungry. Thirty five percent of our boats caught marlin this week with 28 fish released. 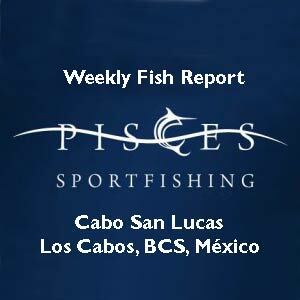 This entry was posted in cabo san lucas, Fish Reports, Pisces Sportfishing, sportfishing on March 17, 2015 by Roger.